All part numbers for MagicFalls water effects begin with “58” followed by numbers or letters representing in order: lip series, waterfall width, water effect, and color as well as bottom feed option, if chosen. Click on a selection for each of the 5 categories below, and the tool will provide the correct MagicFalls part number for ordering purposes. Some option combinations are not possible; in those cases, the unavailable option selection appears in white text. 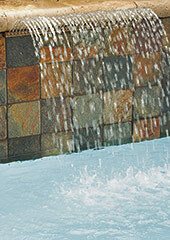 FACTORY CUT RADIUS CURVES: Waterfalls with factory cut radius curves are possible on waterfalls with 6in or 13in lips with Waterfall Sheet or Waterfall Rain water effects. Use the Lip Series Chart link below to select the waterfall width and proper lip length for your desired radius curve. 1) Order the waterfall part number. 2) Then include item number 5890001 on the order to indicate that you need a factory cut radius. 3) Then include a note specifying the exact radius dimension. 4) Be sure to specify “Convex” or “Concave” on your note. Note: 7ft convex radius cut. FACTORY CUT CUSTOM CURVES: Waterfalls with factory cut custom curves are possible on waterfalls that have 13in lips and Waterfall Sheet water effect. 2) Then include item number 5890002 on the order to indicate that you need a custom curve. 3) Then include a template showing the dimensions of the custom curve shape. Item: 5890002 custom curve charge. Note: Refer to enclosed template.